This was a question I was asked every week by dear old John when I worked on a fuchsia nursery. John had been the foreman there for years and knew all there was about growing fuchsias, and how the nursery ran, and after his retirement I took his job, but he still came in once a week, and his ‘Good Morning’ to me was always ‘Well, what d’ya know?’, of course he really knew the answer – not a lot, as I was forever discovering some of his knowledge day by day as I worked there. This month St Ippolyts Church and St Mary’s Church Great Wymondley will give you the opportunity to have a look at that question, ‘Well what d’ya know’, about the church, about God and about some of our ancestors here in our villages that went off to war 100 years ago. On 21st and 22nd June from 11am -4pm we will be holding a Discovery Weekend, when we will have old registers on display dating from before the beginning of World War One, we are hoping to discover the baptism records of the men who died in WW1. Also we shall be displaying the many vestments worn by Revd Ann and fellow priests in the church, and the silver and brass will be on display with explanations to help you answer ‘Well what d’ya know?’. Also at St Ippolyts we will be asking everyone who comes into the Discovery Day exhibition to add a stitch to our new St Ippolyts Church banner, so come along and discover for yourself the wonderful design by Victoria Webster, showing the cherry blossoms, the horses and our saint Hippolytus and the church. 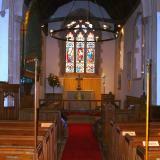 At St Mary’s Little Wymondley the church will be open especially on Sunday 22nd in the afternoon for ‘Tea and Tours’. Refreshments will be available with members of the church who will willingly show you round our dear church and tell something of its history. 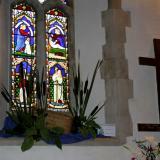 The churches in our Benefice are always open every day for you to come in. Our Discovery Weekend may be just the opportunity you have waited for to help answer that question from dear old John. Confirmation – Confirmation ‘classes’ or ‘groups’ are a way of learning more about the Christian Faith. The service of Confirmation is when you confirm with your own mouth the promises made on your behalf by your Godparents at your Christening . It is never too late to be Christened or Confirmed, so if you are thinking ‘I’d like to know more’ then please contact Revd Ann 0146245752 and together we will explore the question ‘Well,what d’ya know’, not about fuchsias or nurseries this time, but about Jesus. For it is Jesus to whom we are Christ-likened when we are Christened, and it is Jesus who gives us an example to follow so we can grow into good Christian folk. Together we can discover many things about God, ourselves and our world and our church. Isn’t it amazing how a few days of sunshine cheer everyone up, and how even after all that rain the ground seems to have recovered and the gardens are ready for planting. There is an old gardening saying, you may know it, ‘fog in March frost in May’ so watch out for the second week in May, as we had a couple of foggy days in March, and be prepared to look after your tender plants. Spring has sprung in the church too, for later this month the churches will burst into flower as they are decorated to celebrate the season of Easter. We remember how the disciples changed from being upset on Good Friday to rejoicing that Jesus had risen from the dead just a few days later and had appeared to them, personally. Many of us can recall moments in our lives that seem like ‘a Good Friday moment’ when all seems lost and against us, it’s at times like these that we take comfort and indeed excitement from the whole Easter story. Winter turns into spring, Lent turns into Easter, each needs the other however hard and impossible that seems sometimes. I think of my Granddad’s Grandfather clock, if the clock was allowed to chime every quarter hour, it meant the clock had to be wound up every single day, if however you let it just chime the hours then you could have a few days off from winding it up, the spring would last a little longer. In this day and age with all the digital clocks and watches that never need winding, we perhaps have lost the association with spring and energy and the passage of time. Lent provides us with days when we can look forward to Easter and days when we can wind ourselves up for the most Holy week of the Christian calendar. Every year I invite you to come along on this pilgrimage with me as we follow our Lord’s last days and come to that wonderful day of resurrection. How about joining me this year? Enter into this passage of time that the church through the centuries has kept special, and let the words ‘were you there when they crucified my Lord’ touch your very heart and the words of Mary Magdalene ‘I have seen the Lord’ energise you to go and tell others about this whole Easter experience that springs forth from the liturgy of the church. Last year early on Easter Day I stood outside my back door and turned up Radio 4 really loud, with no apologies to my near neighbours, for early on Easter Day Radio 4 plays the verse of ‘Jesus Christ is Risen today, Alleluia!’ How about joining me with that too and let all of St Ippolyts and Great and Little Wymondley hear that Spring has sprung. For we are an Easter People and Alleluia! is our song. Enjoy all those Easter Eggs too. 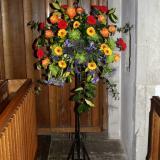 On February 19th Revd Ann has been Vicar at St Ippolyts Church for seven years. Doesn't time fly!! What do people do in church? So what exactly do people do in church? Young Isabel asked me the other day. I wonder what your answer would have been? To say our prayers, sing hymns and songs, hear the Bible read, think about God? It set me thinking too, so what exactly do we do in church, when we come on our own during the week or with others at a service of worship on a Sunday or weekday. Of course ‘what do we do in church?’ doesn’t just mean what we do inside the church building, its more about how we connect what we do in our services with the way we live out our lives. For at various times in our day we may say our prayers, sing songs and read the Bible and think on God, on the bus or train to work, in the comfort of our home, on our own or with friends. But to paraphrase what one of the saints said ‘faith without action really doesn’t exist’ for if you have faith it will cause you to act whenever you see injustices in the world, or hungry people needing food, or as we have seen so much lately, victims of recent floods and storms needing support and help. One of the ways of keeping up to date with what we do in church is to attend our Annual meetings. Like any other organisation local churches have their annual meetings once a year, naturally, and March and April are usually the months they are held. This year at St Ippolyts we will be trying something new, now there’s a novelty!! On Sunday 16th March we will be holding our Annual Parochial Church Meeting within the 9.30am service. You are welcome to come along, as always. As you come into church you will be given a report of all that we did in 2013 and a copy of the church’s accounts showing how much money came into and was paid out of our bank accounts. Before the service actually begins we will hold the first of our annual meetings where our Churchwardens are elected, anyone who lives in the parish can come along and vote. We will then have the first part of the service, say our prayers, sing hymns and hear the Bible read. In place of the sermon I will give ‘The Vicar’s report’ we shall also have a report from our electoral roll officer and from our treasurer, and there will be time for a few questions directly arising from these reports. After singing what is called the Offertory hymn we will think about what we can offer to the churchin our time and talents, and so we shall elect people to be members of the Parochial Church Council and the Deanery Synod, and as we are aware all that we do in church must be honest and true we appoint our Safeguarding officer and our independent auditor. All these people will need our prayers so next in the service we shall pray for them, as well as for our church, our community and the world. The rest of the service will follow the normal pattern as we turn to the altar for Communion, beginning by sharing the peace with each other and after receiving communion and a blessing we will finish the service with one more hymn/song. I hope you will stay afterwards for refreshments and a time to chat and get to know one another more. I am really pleased Isabel asked me the question, and if there are ever any questions you would like to ask me then please do not hesitate to ask, who knows it may give me inspiration for another blog!! Christmas is coming the goose is getting fat, please put a penny in the old man’s hat. As we will all have seen and heard in the news recently, sadly we don’t have to wait until Christmas before an occasion or charity calls on us to put our hands into our wallets and donate, and pounds rather than pennies are the order of the day now. We cannot imagine what it must be like to suffer the consequences of a typhoon, our weather even when extreme is never that bad. Neither can most of us, thankfully, imagine what it feels like to be homeless. The power of television, radio and the Newspapers is such that images appear in our living rooms and at the breakfast table, of crises from the other side of the world almost in real time. So soon after they happen. They tell of babies born in exceptional circumstances and how lives have been changed for ever, in an instant. How does that make us feel? Helpless, sad, informed, quick get the Debit card out and give? And how long before the crisis in the Philippines becomes less of a headline and more a debating point on how best to spend our giving? Not all that long I think. At this time each year we remember the Incarnation, the whole mystery of God becoming man in the child Jesus who was from the beginning homeless, as a young child experienced exile from his home country, and as an adult went without food for days on end. No television or radio then, I wonder what the headlines would have been, maybe he was just one of many births that night. You can almost imagine many years on from the first Christmas morn, the ancient Shepherds telling their grandchildren ‘I remember when I first heard, I first saw, and it’s amazing what that baby went on to do and be’. Who knows perhaps we will be telling folk in many years to come of the time we saw on television or heard on the radio of a baby born to homeless parents and what that child achieved when they grew up into adulthood. I invite you all to say a personal prayer for the people of the Philippines and for those who are trying to help them cope with this huge crisis. As I have said before, prayer doesn’t change God, it does though change us, and even if it means we appreciate our own homes and our own Christmas celebrations more, then that will be good. If as a result of our prayer we feel moved to give more to share with others then that too will be good. Christmas is a time for celebrating a mystery. We will all find different ways of celebrating, be it through the sharing of bread and wine in our services at church or goose, turkey, beef or chicken, on our dinner plates. Perhaps Christmas pudding, or cake, or crackers or a special drink or two in the company of those we love at home. I wish you all a very happy Christmas and don’t be shy in celebrating here even though sad things happen elsewhere, do what you can for others and be kind to yourself – have Boxing day off!